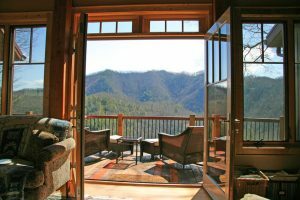 RiverDance is a captivating blend of the best in a traditional Vacation Rental and an upscale Bed and Breakfast. As our guests, nestled on a quiet mountainside, high above the river, you will find your home away from home. Experience the outdoors at its best, day or night, from our Carolina Porch with its barn board fireplace. Relax in front of the massive Arts and Crafts fireplace in the inviting great room, and rest comfortably in your own private quarters. For your convenience a full service kitchen, laundry and high speed WiFi are available. We have Packages available offering Trout Fishing excursions, Rafting and Zip Lining, Culinary Adventures and Massage. Whether it’s a family gathering, a special event, a get away weekend, wanting to experiencing the great outdoors or just relaxing, RiverDance has it all. RiverDance is both pet friendly (dogs) and we love having children around. Start your day with a full continental breakfast including homemade pastries, local granola, yogurts, assorted fresh fruit, juice, coffee, tea and more. Want that easy dinner meal? We have locally made pot pies on hand.